Stations designed for the use on light or medium load capacity belt conveyors with small lump size material. The development of this troughing set is the result of long practical experience in the field. 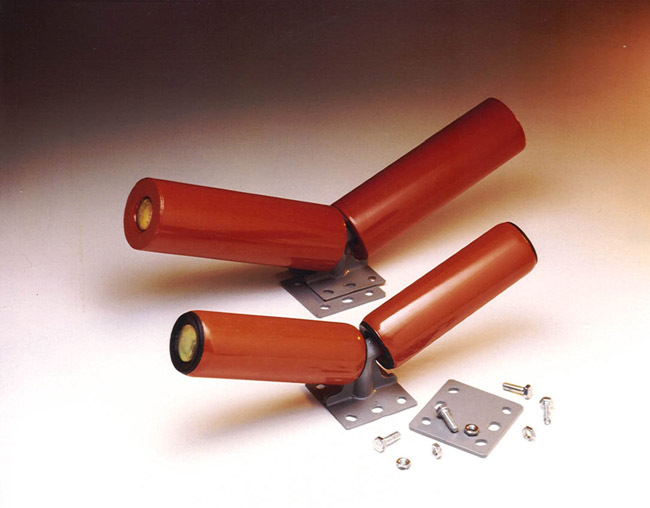 Cantilevered sets are available with rollers from series RTL and MPS and their use is applicable to light or medium load capacity belt conveyors with small material piece size. The support positions the two rollers in amanner that minimises the gap between them, without affecting their free rotation. In this manner the belt is perfectly supported and no damage results even to a flexible belt due to the proximity of the two supportrollers. The cantilevered sets may be located by their support fixing with screws or onto an appropriate base plate part number SPT1316. The support brackets of the set have been designed with longitudinal “fixing” slots to allow for perfect belt alignment.